T-Mobile TV, currently available on the Windows Mobile HD2, is making its way to Android. The app will come pre-loaded on the myTouch 4G and it has already been extracted from the leaked ROM from that device. The app will be powered by MobiTV. The leaked version of the app has proven successful on the G2 and Nexus One, but anyone running Android on the HD2 has not had much luck. Overall, it is a good, pretty app, but the video quality is fairly poor. I am really hoping it is an early build. A 30 day trial is available, but T-Mobile TV will cost $9.99 each month that follows. Let us know what you think! ← T-Mobile Network Almost Brought Down By Instant Messaging App? Pretty cool, but i’m not wasting $9.99 for something I can watch online for free. By the way, Does anyone else think it’s funny that a site dedicated to T-Mobile has AT&T, Verizon, and Sprint ads. I guess you gotta do what you gotta do to make money and I ain’t mad at cha. I don’t control the ad rotation when it goes to the Google ads, I can’t help it, it serves up by topic, in this case wireless. I understand. Not critizing, I just get a chuckle out of it. It’s the same GoGo TV that came on the Vibrant. I don’t get the big deal. You meant MobiTV??? GoGo is in in-Flight internet service, buddy! IF i was able to actually connect that device to a tv via hdmi out then it would be useful… i guess, if i didnt have cable that it! I don’t get it. You are capped at 5gb, but they want you to pay for an application that will eat that up quick? I guess T-Mobile is assuming most people would use this app mainly on wifi? Exactly. I am glad people are seeing what I was talking about with a 5GB cap, and releasing multimedia featured phones. Uhm, since this is being offered through T-Mobile, my guess is that this will NOT count towards you 5GB cap, just like their future hotspot service won’t count towards your mobile data. and why exactly wouldnt it…. because in fact, you are still using data! just trying to understand your logic…..
T-mobile does not charge you to use the Ovi store on a Nokia phone, nor does it charge you to browse music and games at Web2Go. Actually my GF does not have data, but browses web2go and doesn’t get charged. His saying it may work like that. but if you were to go to sites that are linked to that web2go site then you are charged for data! and what are the nokia phones that tmobile offers that doesnt require a smartphone data package that actually has the OVI STORE! And yes they do charge you to actually use the OVI STORE… to browse it is one thing but to actually use it is another. dude. Every Vibrant came with this OUT OF THE BOX. Stock Vibrant came with GoGo and MobiTV. But what the Vibrant didn’t come with is what’s rumored to be on this. So what is this I’m hearing about mentions of the Mytouch4G and the HTC Glacier being one in the same from info found in the ROM? I know the Glacier is SUPPOSED to be dual core. I know the MyTouch ALLEGEDLY was dual core in the beginning, but it had seemed as though that was incorrect. Is the MyTouch legitimately dual core, and T-Mobile hasn’t popped the cork on it? That doesn’t seem to make sense. Was the HTC Glacier NEVER dual core to begin with? Was the dual core processor scrapped from the Glacier during development? It was never stated that the MT4G would be “dual core”. It had been specifically stated as “dual processor” which was just a verbage marketing trick. CPU + GPU = “dual processor”. “dual core” is a whole different ball o’ wax. The Glacier (Which is indeed the myTouch 4G) was never “supposed” to be dual core. If you go back and look at those articles it was “suspected” that it was dual core based pure on the leaked benchmarks and nothing more. At that point no one had any idea what the Glacier was though I believe it was Scotty Brown at Android Guys that guessed it was possibly the project Emerald (which it turns out it is). Why pay $10 when Tmo will just throttle you down and you won’t be able to use it. Looks like more useless bloatware. Maybe people are confused with number “2” next to the processor specs? i.e. it has the Snapdragon core processor v2, not Snapdragon 2 cores? or something of the sort? ummm it’s 2011 almost.. can we get cable/on demand? First I believe the app is WIFI only. Second who cares about this app, it is MobiTV with a new look, and still 10 bucks a month…..
What we need is the WIFI calling app ripped out and made to work, that will benefit more people with service issues. I have tried the one from the G2 update, but got nowhere with it, so maybe someone can find the missing parts in this ROM. 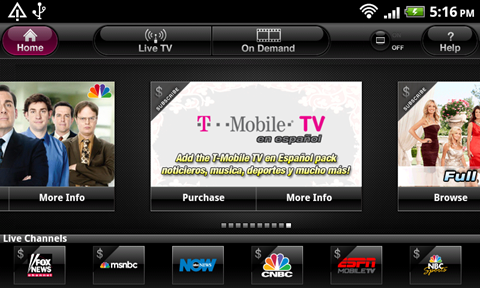 Is there any difference in the tmobile tv app and the mobi tv app? I got a vibrant and use the mobi tv app at least once a day for quick entertainment. Are there any added features or channels over the mobi tv brand, or just a rebranding. I’m guessing Tmobile bought MobiTV or somethin and then rebranded it. Whatever happened to “always free tv” in the MT4G flyer? I can swear I saw that in the leaked document. But seriously, $10/mo is not bad for something like that except that we laready pay for data and T-mo is not exactly unlimited so all its going to do is make you go over the cap and get throttled. I am so getting it too. Tried G2, nice but too buggy at the time. I’m will wait until black friday (mainly to see if any problems will surface) and then make my move on either black or red one. While did not appeal for some reason (too busy, too many colors) and Plume (or eggplant or whatever they call it) is not exactly attractive neither, at least for me. Now, since that has Sense, we ***theoreticaly*** should be able to use unRevoked method to root it, although I’m not sure why would I even bother…. I have it on my g2 and it works like a dream over the fast network!! When you run the app the first time, it tells you that some content is free and that premium content requires a subscription. It’s not 9.99 a month if you cancel the subscription. You can watch the free content after you cancel the subscription. This is different from mobitv. Is this an app that can be downloaded to the G2 or does it take extra effort? Also my understanding was that basic TV was free and there was a 30 day trail for expanded TV. Works fine on my hd2 running android. (bangsters at 180dpi). Isn’t this just MobiD! @k err I mean MobiTV? where is the high res streaming tv service already?? And for that matter WHY does this country not get Digital Tuner cellphones like other country’s? Hi, i put it up on xda in the G2 forum — this app is 9.99 for premium use, and free for basic package. the basic package includes some live streaming channels and on demand. it’s listed in the HELP section. The app works on both 3G and WIFI. Thanks for that. I remember reading somewhere that the basic package was free, only reason I would actually want it. Still want this to come to Vibrant or else myTouch 4G it is. Was this part of the official 3.14 release, not in the leaked version of 3.14? I was all excited when MobiTV came out on my HD2, only to be disappointed that is did not work well at all. Half the time the signal was lousy, even when I was in a strong 3G area. Another issue was that if I wanted to watch a TV show, MobiTV would download them in 10 minute segments, meaning to watch a one hour show (sans commercials)I had to download four to five segments. Lastly, every few minutes I would lose a signal and the screen would thus freeze requiring my closing the program and even a device reboot. I ended up not using MobiTV beyond the 30 day free trial, albeit T-Mobile in one of its many incompetent customer service mistakes kept charging me, for three months (despite assurances each month that I would not be charged). In fact, T-Mobile denied that I canceled and I had to threaten to cancel all the accounts in order for retentions to issue a credit and finally stop charging me monthly. Also, I chose to use Slingbox to run my cable TV to my phone. That setup works fantastic and in June 2010 they came out with an Android version of the software so I can run real live TV on my Vibrant. IMHO if you have cable TV at home you should check out Slingbox Mobile rather than wasting time with these carrier TV apps or MobiTV. Sidenote: I wonder what happened to MobiTV’s relationship with T-Mobile. Maybe MobiTV flopped with T-Mobile, so T-Mobile cut the cord? Maybe T-Mobile TV is simply MobiTV with T-Mobile branding over it? Maybe T-Mobile is using MobiTV under a license arrangement? It’s the same in concept as watching YouTube videos. If you watch in low resolution the videos work fine. But when you press “watch in HQ” there may be lag. Moreover, YouTube HQ videos use more bandwidth so carriers prefer you not watch YouTube videos in HQ mode. Yes, your personal experience may differ, I am only relating mine to you. i believe it’s just a rebranded MobiTV. The mobitv libs are in the apk.